Third annual Wigtown weekend event promises the universe in a nutshell and looks forward to Scotland’s stellar future in space exploration. Half a century since Neil Armstrong set foot on the Moon and a decade after Galloway set up Britain’s first Dark Sky Park, Big Bang explores humanity’s fascination with space. The weekend of events in Wigtown from 8 to 10 March brings together broadcasters, space scientists, writers, storytellers and others for a series of talks and activities – including a chance to stare at the stars from one of the planet’s darkest landscapes. Among the guests are professors Heather Couper CBEand future astronaut Nigel Henbest, known to millions for their TV and radio shows as well as their books about astronomy. The pair will look at how, from at least 40,000 years ago to the present day, humans have probed the beauty and the mysteries of the night sky. They will also discuss the remarkable, and often maverick, scientists who have helped us discover the secrets of space. Couper said: “It’s part of our psyche, we have a fascination with the stars that’s absolutely primal – looking at the night sky is like staring at an ever changing and utterly beautiful landscape. “All round the world there are ancient monuments aligned to astronomical events, like the Callanish Stones and Maeshowe in Scotland. And we are still trying to understand what they were for – the latest evidence for Stonehenge suggests it was related to the midwinter sunset rather than the midsummer sunrise. Others who they will talk about include Copernicus, Caroline and William Herschel, Fred Hoyle, Edmund Halley and Thomas Henderson of Dundee, who was the first person to measure the distance to the star Alpha Centauri – the closest star system to our own. 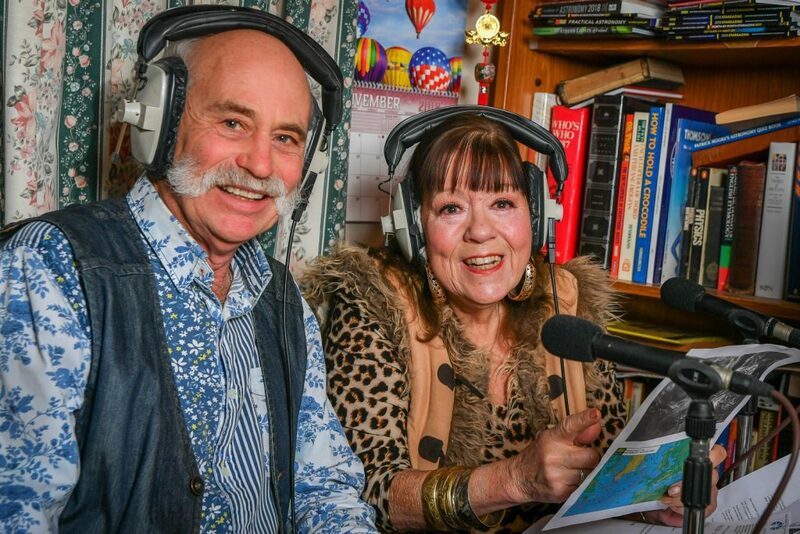 Couper, whose father was a Scottish RAF pilot from near Dundee, and Henbest have recently published a book entitled The Universe Explained: A Cosmic Q&Atackling 200 questions the pair have been asked, from how to go to the loo in space to the nature of dark matter. In a second Big Bang talk Henbest, an honorary professor at Dundee’s Duncan of Jordanstone College of Art and Design, will discuss the development of Richard Branson’s Virgin Galactic programme and the training he has undergone in readiness to blast off aboard one of the early flights. Henbest isa strong believer in the potential for a future Scottish spaceport – with its location making it ideal for launching satellites into polar orbits ideal for reconaissance and weather observation. making it ideal for launching satellites into polar orbits ideal for reconaissance and weather observation. As one of the first champions of the Dark Skies movement in the UK, he is also delighted to be in Wigtown in the year that the Galloway Forest Dark Sky Park celebrates its 10thbirthday. Another Big Bang event will be Our Dark Sky Decade, a celebration of the UK and Europe’s first Dark Sky Park, established in Galloway in 2009. It has become a major visitor attraction and boasts skies 38 times darker than in a city and the chance to see more than 7,000 stars. Many come to take part in outdoor activities, visit the observatory, stargaze or simply enjoy the benefits of escaping light pollution. One of the speakers, Forest Enterprise Scotland Business Manager Keith Muir, said: “We were the first and it’s been a huge success – inspiring other projects all over the world and attracting visitors from far and wide. People have an intrinsic fascination with space and there’s even more interest now with new expeditions to the Moon and Mars. And it’s not just stargazing people come for, especially in Scotland with its frequent cloudy skies, it’s also to escape light pollution. Muir said: “Some 85% of people are never in real darkness. Our bodies can’t rest and recover properly in constant light, it affects our natural rythms. We also waste vast amounts of money and energy on unecessary light. Big Bang will also be paying tribute to one of the greatest scientists the world has ever seen when Professor Malcolm Longairdelivers a talk entitled James Clerk Maxwell’s Legacy. Longair, originally from Dundee and a former Astronomer Royal for Scotland, said: “He is one of my great heroes – he shaped the whole of modern physics and fully deserves to be up there with Newton and Einstein. In 1871 Maxwell was the first Cavendish Professor of Physics at the University of Cambridge and oversaw the establishment of the Cavendish Laboratory which has made many enormous contributions to the advancement of science with now 33 Nobel Prize winners. Following in Maxwell’s footsteps, Longair became the tenth Head of the Cavendish Laboratory and led the successful fundraising efforts to build a new Cavendish Laboratory, now under construction and to be completed in 2022. He has also been closely involved with a number of NASA and ESA (European Space Agency) missions. Longair is a great admirer of institutions such as the UK Astronomy Technology Centre in Edinburgh and believes the country has a great future in space. “Scotland always has, and continues to punch far above its weight in this field. The co-operation between universities is wonderful and the Scottish Government seems to have a far more enlightened approach to funding research than the one in London. Adrian Turpin, Creative Director of Wigtown Festival Company which organises Big Bang, said: “There’s an enormous interest in space right now with serious plans for a Scottish spaceport, the Chinese landing on the dark side of the Moon and the first successful flight Virgin Galactic spaceflight. For the full programme see www.wigtownbookfestival.com.